The life and exploits of this most popular national hero of the Scots have been principally preserved in a legendary form by poetry and tradition, and are only to a very small extent matter of contemporary record, or illustrated by authentic documents. 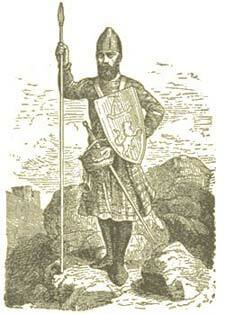 There is no extant Scottish chronicler of the age of Wallace. Fordun, the earliest of his countrymen from whom we have any account of him, is his junior by nearly a century. Wyntoun, the next authority, is still half a century later. His chief celebrator is the metrical writer Blind Harry, or Harry the Minstrel, whose work confesses itself by its very form to be quite as much of a fiction as a history, and whose era, at any rate, is supposed to be nearly two centuries subsequent to that of his hero. Some few facts, however, may be got out of the English annalists Trivet and Hemingford, who were the contemporaries of Wallace. There are contradictory statements of the year of his birth, but it is probable he was born about 1270. His family was one of some distinction, and he is said to have been the younger of the two sons of Sir Malcolm Wallace, of Elderslie and Auchinbothie, in the neighborhood of Paisley. His mother, who according to one account was Sir Malcolm's second wife, is stated by the genealogists to have been Margaret, daughter of Sir Raynald or Reginald (other authorities say Sir Hugh) Crawford, who held the office of Sheriff of Ayr. The history of Wallace down to the year 1297 is entirely legendary, and only to be found in the rhymes of Harry the Minstrel; though many of the facts which Harry relates still live as popular traditions in the localities where the scenes of them are laid, whether handed down in that way from the time when they happened, or only derived from his poem, which long continued to be the literary favorite of the Scottish peasantry. Harry, who, it may be observed, professes to translate from a Latin account written by Wallace's intimate friend and chaplain, John Blair, makes him to have been carefully educated by his uncle, a wealthy churchman who resided at Dunipace, in Stirlingshire, and to have been afterward sent to the grammar-school of Dundee. Here his first memorable act is said to have been performed; his slaughter of the son of Selby, the English governor of the castle of Dundee, in chastisement of an insult offered him by the unwary young man; Wallace with his dagger struck him dead on the spot. This must have happened, if at all, in the year 1291, after Edward I. of England had obtained possession of all the places of strength throughout Scotland on his recognition as Lord Paramount by the various competitors for the crown, which had become vacant by the death of the infant Margaret, the Maiden of Norway, in September, 1290. This bold deed committed by Wallace, who in making his escape is asserted to have laid several of young Selby's attendants as low as their master, was immediately followed by his outlawry. He now took to the woods, and gifted as he was with eloquence, sagacity, and other high mental powers and accomplishments (to this the testimony of Fordun is as express and explicit as that of his poetical biographer), not less than with strength and height of frame and all other personal advantages, he soon found himself at the head of a band of attached as well as determined followers, who under his guidance often harassed the English soldiery, both on their marches and at their stations, plundering and slaying, as it might chance, with equally little remorse. Particular spots in nearly every part of Scotland are still famous for some deed of Wallace and his fellow-outlaws, performed at this period of his life; but for these we must refer to the Blind Minstrel. The woods in the neighborhood of Ayr would seem to have been his chief haunt; and some of his most remarkable feats of valor were exhibited in that town, in the face and in defiance of the foreign garrison by which it was occupied. Both his father and his elder brother are said to have fallen in rencontres with the English during this interval. It was now also that he fell in love with the orphan daughter of Sir Hew de Bradfute, the heiress of Lamington, having, it is said, first seen her at a church in the neighborhood of Lanark. The Scotch writers affirm that this lady, whom he appears to have married, and who at any rate bore him a daughter, a year or two after forming her connection with Wallace fell into the hands of his enemies, and was barbarously executed by order of Hazelrig, the English Sheriff or Governor of Lanark, while her husband, or lover, was doomed to witness the spectacle from a place where he lay in concealment. Such private injuries were well fitted to raise his hatred to an unextinguishable flame. How far the guerilla warfare maintained by Wallace and his associates contributed to excite and spread the spirit of resistance to the English government, we have scarcely the means of judging; but it seems probable that it aided materially in producing the general insurrection which broke out in the spring of 1297. The accounts we have of the commencement of that movement represent Wallace at its head, in command of a considerable force, and in association with some of the most distinguished persons in the kingdom, such as the Steward of Scotland and his brother, Wishart, Bishop of Glasgow, Sir William Douglas, etc. Soon after this he was joined by the younger Robert Bruce (afterward King Robert I.) who had hitherto, as well as his father, who was still alive (the son of the original competitor for the crown), professed to adhere to the English king. This, however, appears to have been but an ill-cemented confederacy. When the force despatched by Edward to quell the revolt presented itself before the Scottish army posted near Irvine, in Ayrshire, the leaders of the latter, throwing off the authority of their nominal chief, could no more agree what to do than whom to obey: and the result was that Bruce, the Steward, Douglas, and others of them, availing themselves of the diplomatic talents of the Bishop of Glasgow, concluded a treaty on July 9th, by which they agreed to acknowledge Edward as their sovereign lord. All the rest ultimately acceded to this arrangement, except only Wallace and his friend, Sir Andrew Moray, of Bothwell. The treaty of Irvine, which is printed by Rymer, is, we believe, the first of the few public documents in which mention is made of Wallace; to the instrument (which is in French) are subjoined the words, "Escrit a Sir Willaume," the meaning of which Lord Hailes conceives to be, "that the barons had notified Wallace that they had made terms of accommodation for themselves and their party." The words, moreover, on the supposition that they refer to Wallace, of which there seems to be little doubt, show that he had before this date obtained the honor of knighthood. It had probably been bestowed upon him (as was then customary) by some other knight, one of his companions in arms, since his elevation from being the captain of a band of outlaws to be the commander-in-chief of the national forces. Wallace now retired to the north, carrying with him, however, a considerable body of adherents, to whom additional numbers rapidly gathered, so that he soon found himself in a condition to recommence aggressive operations. Directing his force to the northeastern coast, he surprised the castle of Dunottar, cleared Aberdeen, Forfar, Brechin, and other towns of their English garrisons, and then laid siege to the castle of Dundee. While he was engaged in this last attempt, news was brought that the English army was approaching Stirling; upon which, leaving the siege to be carried on by the citizens of Dundee, he hastened to meet the enemy in the field. The result was the complete defeat and rout of the English, at the battle of Stirling Bridge, fought on September 11, 1297--a battle which once more, for the moment, liberated Scotland. The English were immediately driven or fled from every place of strength in the country, including Berwick itself. Availing himself of this panic and of the exhilaration of his countrymen, Wallace pursued the fugitives across the border; and putting himself at the head of a numerous force, he entered England on October 18th, and, remaining till November 11th, wasted the country with fire and sword from sea to sea, and as far south as to the walls of Newcastle. It was during this visitation that the prior and convent of Hexham obtained from him the protection preserved by Hemingford. It is dated at Hexildesham (Hexham), November 7th, and runs in the names of "Andreas de Moravia, et Wilhelmus Wallensis, duces exercitus Scotiae, nomine praeclari principis Joannis, Dei gratia, Regis Scotia illustris, de consensu communitatis regni ejusdem," that is, "Andrew Moray and William Wallace, commanders-in-chief of the army of Scotland, in the name of King John, and by consent of the community of the said kingdom." The John here acknowledged as King of Scotland was Baliol, now in the hands of Edward, and living in a sort of free custody in the Tower of London. Wallace's associate in the command was the young Sir Andrew Moray, son of his faithful friend of that name, who had retired with him from the capitulation of Irvine, and who had fallen at the battle of Stirling Bridge. One of the most curious of the few public papers in which the name of Wallace occurs was a few years since discovered by Dr. Lappenburg, of Hamburg, in the archives of the ancient Hanseatic city of Luebeck. It is a letter, in Latin, addressed to the authorities of Luebeck and Hamburg, informing them that their merchants should now have free access to all ports of the kingdom of Scotland, seeing that the said kingdom, by the favor of God, had been recovered by war from the power of the English. The letter is dated "apud Badsing tonam" (the true word, it has been suggested, is probably Haddingtonam), October 11, 1297, that is, a few days before the invasion of Cumberland and Northumberland. It is in the name of "Andreas de Moravia et Willelmus Wallensis, duces exercitis regni Scotiae, et communitas, eiusdem regni"--like the Hexham protection--but without any mention of King John. But this supreme elevation did not last long. Supported only by his own merits and the admiration and attachment of his humbler fellow-countrymen, Wallace, a new man, and without family connection, would probably have found it difficult or impossible to retain his high place, even if he had had nothing more to contend with than domestic jealousy and dissatisfaction. Fordun relates that many of the nobility were in the habit of saying, "We will not have this man to rule over us." Meanwhile the energetic English king, who had been abroad when the defeat of Stirling Bridge lost him Scotland, had now returned home, and was already on his march toward the borders at the head of a powerful army. A body of English, which had landed in the north of Fife, led by Aymer de Vallois, Earl of Pembroke, is said by the Scottish authorities to have been attacked and routed by Wallace on June 12, 1298, in the forest of Blackironside, in that county; but when the two main armies met on July 22d, in the neighborhood of Falkirk--the Scots commanded by Wallace, the English by their king in person--the former, after a gallant and obstinate resistance, were at last forced to give way, and the battle ended in a universal rout accompanied with immense slaughter. This defeat did not put an end to the war; but it was taken advantage of by the Scottish nobility to deprive Wallace of his office of guardian or chief governor of the kingdom. The Scottish accounts say that he voluntarily resigned the supreme power; it is certain, at any rate, that Bruce, his rival Comyn, and Lamberton, Bishop of St. Andrew's, were now appointed joint guardians of Scotland, still in the name of Baliol. For some years after this our accounts of Wallace are slight and obscure; but he appears to have returned with a chosen band of followers to the practice of the desultory warfare in which he had originally distinguished himself. The legendary histories continue to detail his deeds of prowess performed in harassing the enemy both on their marches and in their camps and strongholds. And to fill up the story, they also make him to have paid two visits to France--the first in 1300, the second in 1302. The next well-ascertained fact regarding him is that when the Scottish leaders were at last obliged to submit to Edward at Strathorde, on February 9, 1304, Wallace was not included in the capitulation, one of the clauses of which (printed in the original French in Ryley's "Placeta Parliamentaria") is to the effect that as for Wallace (Monsieur Guillaume de Galeys), he might, if he pleased, give himself up to the king's mercy ("quil se mette en la volunte et en la grace nostre seigneur le Roy, si lui semble, que bon soit"). He was soon after summoned to appear before a parliament or convention of Scotch and English nobility, held at St. Andrew's; and upon their not presenting themselves, he and Sir Simon Frisel, or Fraser, were pronounced outlaws. For some time his retreat remained undiscovered, although his active hostility still continued occasionally to make itself felt. A principal person employed in the attempts to capture him appears to have been Ralph de Haliburton; but how he was actually taken is not known. Sir John Menteith (a son of Walter Stewart, Earl of Menteith), to whose treachery his delivery to the English king is attributed by Blind Harry and popular tradition, appears to have really done nothing more than forward him to England after he was brought a prisoner to Dumbarton Castle, of which Menteith was governor under a commission from Edward. On being brought to London, Wallace was lodged in the house of William Delect, a citizen, in Fenchurch Street; and on the next day, being the eve of St. Bartholomew, he was brought on horseback to Westminster, and in the hall there, "being placed on the south bench," says Stow, "crowned with laurel for that he had said in times past that he ought to bear a crown in that all," he was arraigned as a traitor, and on that charge found guilty, and condemned to death. After being dragged to the usual place of execution--the Elms, in West Smithfield--at the tails of his horses, he was there hanged on a high gallows, on August 23, 1305, after which he was "drawn and quartered." His right arm was set up at Newcastle, his left at Berwick; his right leg at Perth, his left at Aberdeen; his head on London Bridge. Wallace's daughter, by the heiress of Lamington, married Sir William Bailie, of Hoprig, whose descendants through her inherited the estate of Lamington.